Master Car Builder Benjamin Strong would be pleased to build you one to your specifications and requirements. Should you be interested, Please contact me at Richard@CocoanutandPalm.com . Pretty girl not included . 1955� Kabriolet Custom Monster! U.S. Import Volkswagen Convertible first registered in 1956. This car and the word conservative do not belong in the same sentence. The builder pushed the limits of modern day building into the Volkswagen community when it comes to custom and quality. The final price tag of this build hit the 100K plus checkbook. Regardless of what it took to build the car it will be the new owner's chance to save not only 1000's of hours of work and even more thousands in the pocket book. Best of all this car showcases a pressurized 600hp racing engine detuned to about 300 horsepower for street use. This engine has never been subjected to the drag strip but would give any car on the strip a run for its money. This car is set up to drive easily as a weekend driver and is not at all fussy like a race car, even though it is built like one. Very close to being a 100 point car in quality. 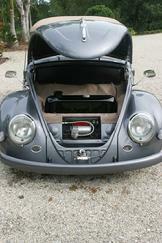 One of the finest custom Volkswagen Cabriolets you have ever seen if not the finest. 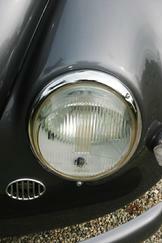 Built by Volkswagen specialist Benjamin Strong to exacting standards in the Euro-Techno Style. Less than 50 miles on the car since full custom build. This car has been mostly trailered. Absolutely everything on the car has been addressed, taken apart, renewed, refinished, replaced or whatever it might take to make this car as good as it can possibly be. Nothing has been down to second best standards only the best. The chassis is completely built/rebuilt as if new. The body has been refitted, restored, and refinished including all fasteners, attachments, and gaskets. Everything in the Engine and drive train is new and high-tech, including the fuel delivery system, hydraulic clutch, wheel bearings and suspension. Nothing in the engine and drivetrain is less than state-of-the-art including computer controlled fuel injection/ignition that can be tuned as you drive to your performance curves by cell phone from the factory in California. Nothing has been left untouched. At some point you got to laugh. When we grow older our toys become bigger and better. Entire pan soda blasted and dipped. The pan was stripped, rebuilt, strengthened, gusseted, and refinished. The serial numbers on the body and pan match. The pan and chassis are fully powder coated to show-quality satin finish. Entire body soda blasted and dipped. All body parts are the correct parts for the year. All fasteners stainless steel button head or other appropriate stainless steel fasteners. The body has been sectioned and realigned to original specifications with new rails and then concours refinished. The inside of the fender wells and all other under-car areas are show-quality finished and painted to the same degree of finish as the exterior. Approximately 600 hours of bodywork, painting, and making of custom sheet metal parts. 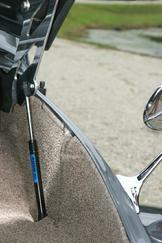 Original correct H-Pattern apron has been discreetly custom fitted to the Turbo System with the smoother pre 55 look. Albert reproduction mirrors, Original Wolfsburg Crest and Karmann badge. The builder decided to use the rare 55 only rear California spec taillights. 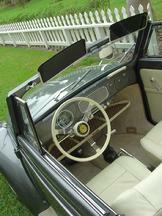 The car has the Petri 3 spoke steering wheel with the Golden Lady horn button. 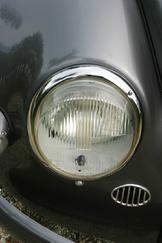 The car was fitted with a flawless clear needle Kilometer Speedometer. 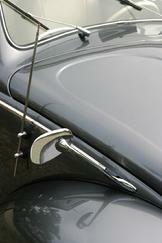 Swan rearview mirrors aftermarket reproductions of the originals. The original deck lid and bonnet seals and channel were removed, body-smoothed and rebuilt to eliminate the possibility of rusting. Entire interior of car has Dynamat sound deadening material - inside doors, quarter panels, floors, rear deck, front and rear firewalls. SAW Sway-A-Way suspension front and rear. 4�" narrowed and gusseted front beam with Sway-A-Way heavy duty leaves. 28mm Sway-A-Way torsion bars in rear. CB Performance adjustors. Urethane bushings. Rebuilt original steering box to factory specs. Chromed trailing arms. Chromed tie rods and tie rod ends, flipped for no bump steer. Original tie rod locations welded and relocated so that the steering does not hit the bottom of the gas tank with the new steering geometry. New king and link pins and bushings with 2�" drop spindles. AirKewld "Bad Series" 11" cross-drilled disc brakes. Rear discs are vented. 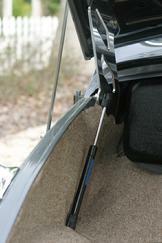 Sway-A-Way adjustable swing plates in rear. Anodized BMD serpentine pulley system. Custom Engine Shrouding built and finished to fit engine application. 3/8" Braided Stainless fuel line for fuel injection pressure and return lines. Braided stainless steel oil and breather lines. A/N fittings throughout entire fuel and oil system. 2110cc Turbo Fuel Injected Engine built by race engine builder Benjamin Strong. CB Performance High-Roof aluminum case. 10mm ARP head studs. 82mm forged counterweighted nitrited crankshaft. Chromolly 5.7 inch H-Beam rods with ARP bolts. Rotating assembly balanced. Cima forged pistons with teflon buttons on wrist pins and Total-Seal rings. CB Performance round port heads. 44mm x 37.5mm stainless steel valves. Dual Hi-Rev springs with titanium keepers. CB Performance racing lifters. Chromolly push rods. CB Performance Turbo-Grind cam. Competition Engineering forged straight-cut cam gears. Heavy duty oil pump. 1� quart deep sump oil sump for a total of 5� quarts plus lines and filter. TO3/TO4 hybrid turbo 1-5/8" ceramic coated turbo header. CB Performance Quick-tune EFI programmable computer fuel injection - 65# injectors and computer controlled ignition system with 50,000 volt coil. AC Industries 95 amp alternator. Killer-V welded balanced fan. Anodized BMD serpentine pulley system. Custom Engine Shrouding built and finished to fit engine application. 3/8" Braided Stainless fuel line for fuel injection pressure and return lines. Braided stainless steel oil and breather lines. A/N fittings throughout entire fuel and oil system. Rhino transmission case built with all Weddle race gears and solid shift forks, Super-Diff heavy-duty side plates and Sway-A-Way axles. Kennedy Stage-3 2600# pressure plate and Center-Force Dual Friction clutch disk, hydraulically operated. 17" x 7" front, 18" x 8" rear - Billet Specialties wheels. Pirelli P Zero Nero 205/40 ZR-17 tires in front. Pirelli P Zero Nero 215/45 ZR-18 tires in rear. Authentic reproduction German square weave carpeting in "oatmeal" color. "Bone" color Leather interior including door and quarter panels. Polished billet aluminum door pulls, window cranks, and dash knobs. Authentic 1950s aftermarket Volkswagen dash script. Original rare restored flip-up pre 57 convertible only rearview mirror. Original very hard to find Big M Motorola radio. I'm not sure whether this works as it has never been hooked up. The original pre 57 convertible glass rear window. There is some sand pitting in the original roll-up glass we are locating perfect glass at the moment. Bamboo convertible Bambus Tray under-dash parcel shelf. Gas tank hot dipped and coated (lifetime coating). Convertible top frame rebuilt and powder coated. New canvas convertible top with full headliner. All new wiring harness, fuse boxes, etc. All original switches rebuilt to factory specs. Braided stainless oil and brake lines. On-board VIAIR 280C air compressor with two gallon tank for fill tires and other compressed air needs.